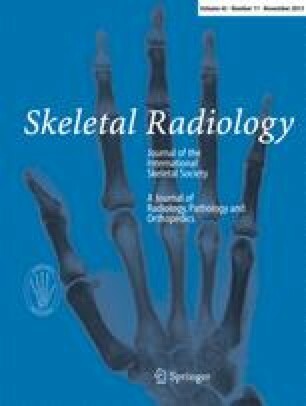 To assess the intraobserver, interobserver, and test-retest reproducibility of minimum joint space width (mJSW) measurement of medial and lateral patellofemoral joints on standing “skyline” radiographs and to compare the mJSW of the patellofemoral joint to the mean cartilage thickness calculated by quantitative magnetic resonance imaging (qMRI). A couple of standing “skyline” radiographs of the patellofemoral joints and MRI of 55 knees of 28 volunteers (18 females, ten males, mean age, 48.5 ± 16.2 years) were obtained on the same day. The mJSW of the patellofemoral joint was manually measured and Kellgren and Lawrence grade (KLG) was independently assessed by two observers. The mJSW was compared to the mean cartilage thickness of patellofemoral joint calculated by qMRI. mJSW of the medial and lateral patellofemoral joint showed an excellent intraobserver agreement (interclass correlation (ICC) = 0.94 and 0.96), interobserver agreement (ICC = 0.90 and 0.95) and test-retest agreement (ICC = 0.92 and 0.96). The mJSW measured on radiographs was correlated to mean cartilage thickness calculated by qMRI (r = 0.71, p < 0.0001 for the medial PFJ and r = 0.81, p < 0.0001 for the lateral PFJ). However, there was a lack of concordance between radiographs and qMRI for extreme values of joint width and KLG. Radiographs yielded higher joint space measures than qMRI in knees with a normal joint space, while qMRI yielded higher joint space measures than radiographs in knees with joint space narrowing and higher KLG. Standing “skyline” radiographs are a reproducible tool for measuring the mJSW of the patellofemoral joint. The mJSW of the patellofemoral joint on radiographs are correlated with, but not concordant with, qMRI measurements.